Free transport available to local hotels and pubs! Bed & Breakfast with a View! Welcome to Sea Crest Farmhouse Quilty, near Spanish Point, County Clare, Ireland - B&B accommodation in a quiet, elevated area with excellent views to the Atlantic Coastline, the Cliffs Of Moher and the Aran Islands! Sea Crest is a fully working dairy farm - so there are plenty of animals around! Children will especially enjoy our donkeys Lizzy and Sandy as well as our rabbits! Our guests usually really enjoy the goings-on around the farm. 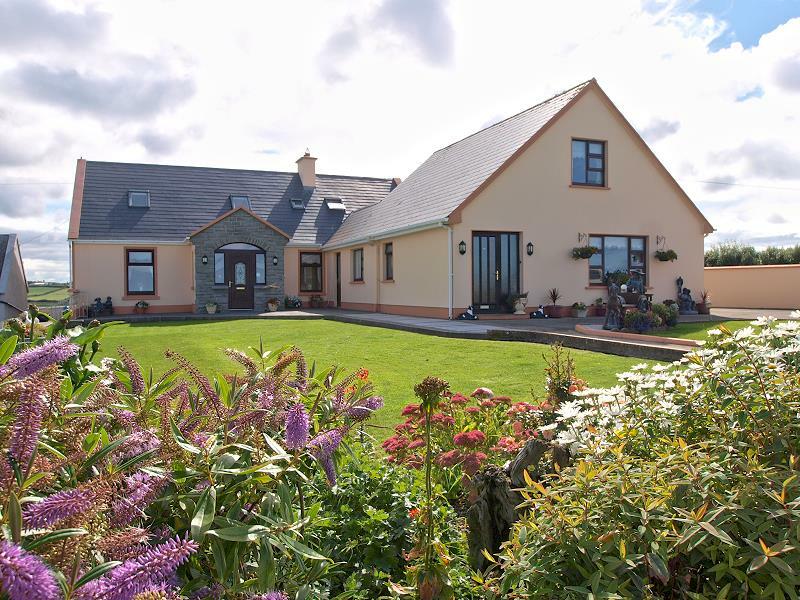 On fine days guests like to sit outside and enjoy our fine flower garden with a beautiful view over the West Clare Countryside to the Atlantic Ocean and the Cliffs of Moher, relax in our sun room, or take a stroll down the farm. We have newly furnished double, twin and family guest rooms, all en-suite! Tea-/Coffeemaking facilities and colour TV are standard in all rooms. The spacious breakfast room has TV and an open fire-place. We offer separate arrangements - e.g. room without breakfast too! Car parking is not a problem as it is very safe and quiet off the main route. There's a shed available for motorbikes and your bicycles.